At the #140Conf in New York City, Philip Nelson shares the story behind his latest album “Adventures from the Road”. Thanks to Jeff Pulver and Alan Weinkrantz for making this possible! Seven years ago a Texas company called NewTek launched TriCaster, a product that essentially puts all the equipment from a TV news truck into one box. It’s affordable as broadcasting equipment goes, with rigs as cheap as $5000. There is even a video interview with yours truly! Thank you for applying to perform at SXSW. This year, SXSW Music received and reviewed over 10,000 submissions from bands all over the world. Unfortunately, this means that SXSW must turn down many artists. Wanted to wish all of my insanely cool friends a Merry Christmas and Happy Hanukah! Your support for my album has been overwhelming! Shout outs are in order to the people behind the music. Eric Neal and Camille Cortinas, Mike Manning, Peter Himmelman, Marcos Hernandez, Seibold, Wendy Crowe-Johnson and all of my Kickstarter supporters!! Got a great message from Amy Vallery tonight about my CD. BTW: Jesse is Amy’s 5 year old son. LOL! I’ve made it! I’ve Made it!! During my travels, I meet all types of people and 3 guys and one girl really standout from my 2011 adventures.. Zac, Taylor and Isaac Hanson and their manager Rebecca! Great people who would do anything to help someone in need! 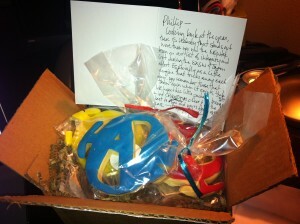 Now I’m off to eat some Hanson logo cookies! “Adventures from the Road” gets a Jeff Pulver shout out from Israel!!! Jeff Pulver is “Da Man”…. Not only is the co-founder of Vonage, VON (Video on the Net) and the 140 Conf but he was also a kickstarter back for my new album “Adventures from the Road”.. I was excited today when he posted a listening to the album shout out from Israel!